Pig Ears are slow roasted and basted in their own pork juices to achieve that wonderful, chewy texture and deep, rich flavor that dogs crave. The wonderful chews are then dried to reach the delectable consistency dogs love. Your dog will beg for more! They are high in protein and very easy to digest. There are no artificial colors, artificial flavors or preservatives in this delicious treat. 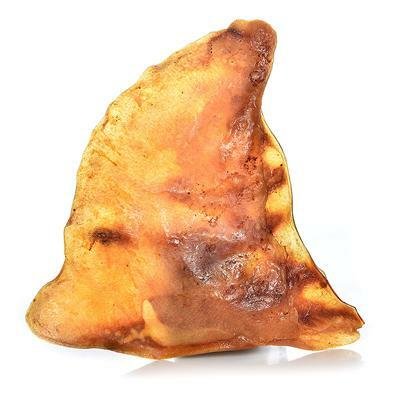 Pig Ear chews are great for keeping your dog happily occupied and satisfied for hours. On car trips, they will keep your dog content and your car's interior mess- and slobber-free. The chewing action of Pig Ears cleans your dog's teeth in a natural way, removing tartar and decreasing plaque build-up. They also help keep the "doggy breath" away. Keep a supply on hand for those times when your dog deserves a special treat! Pig Ears are suitable only as an occasional treat; if your pet is overfed with them, they may cause diarrhea, vomiting, and weight gain.